Many times, when a stray dog is found on train tracks, passengers on board the train arrive late to their destination because the train comes to a halt while authorities remove the dog. Another outcome many times is a sad one, the train continues its path and passengers simply feel a bump on the tracks. However, for a train conductor in Santiago, Chile, the second choice – killing the dog on the tracks – was not an option. While the man could have called authorized personnel to remove and rescue the dog, the driver instead stopped the train, descended on the tracks and rescued the dog himself. On the video, you can see the hero man approach the scared pooch. The man calls the pet over but when the dog doesn’t move he slowly reaches for the dog and hopes not to get bitten. Fortunately, the dog welcomed the rescue and the train conductor grabbed the dog by the skin of the neck and lifted him to safety. 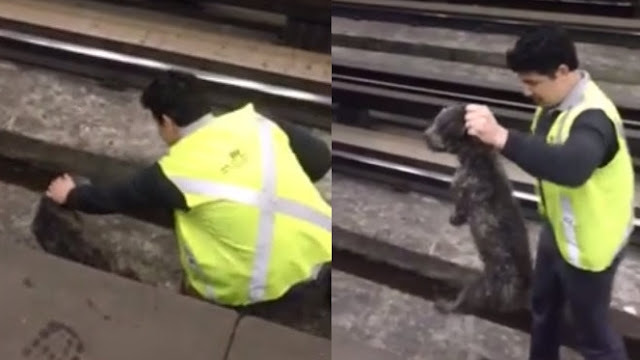 Another train worker received the dog and helped saved the pooch. All passengers applauded the man. He is a true hero! Responses to "Train Conductor Stops Train and Rescues Dog"
Bravo!!!! There ARE some compassionate, loving good people in the world! Wonderful human kindness! What great guys. Bravo! Faith in Humanity restored again....by ordinary people. thank God. Wish the driver of the train that killed my pup had been so kind. Awesome. Let's hope they brought it to a place that will do the right thing. Clean, check for illnesses and give it a chance for adoption.